This week in Your Parents Basement, we are whipping our way past rabid dogs to save Princess Whatsername! 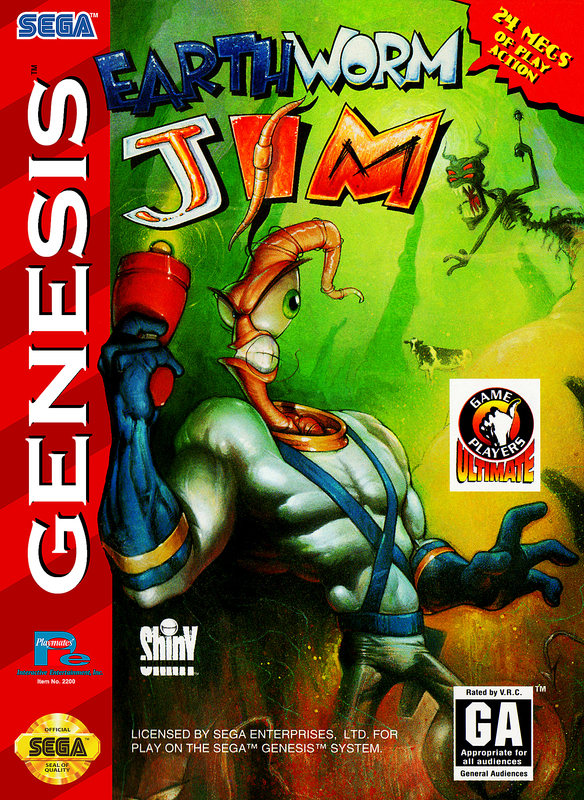 From 1994, we’re playing Earthworm Jim by Shiny for the Super Nintendo and Sega Genesis. You can manually download this week’s groooovy podcast here or subscribe to the show via the iTunes store. To manually subscribe, use this link in the device / podcast player of choice. You can also follow us on Twitter, or ‘like’ us on Facebook. 0:00 – Intro, which features one of the weird commercials that aired on TV for Earthworm Jim. You can watch the whole thing here. 38:30 – Emails! A special friend writes in, and a listener has an Ask about Japanese arcades. 49:30 – It’s the new favorite segment that’s sweeping the land! Ask The Sweet Boys. 58:00 – Snifferoo. It is a platforming video game that we will be playing that involves playing a platforming video game. – According to Price Charting, Earthworm Jim has retained its value pretty well. The loose cart still goes for $15 to $25, depending on the platform, with double the price for the box and manual included. – As mentioned by Pat on the show, here is Pacman with single-celled organisms! – The lead designer from Earthworm Jim says he would be open to doing a sequel. That, and more, are in the linked Reddit AMA. – Also on Reddit: Is it possible for Scrooge McDuck to swim through the gold coins in his money vault? Probably not. – Cassidee Moser of IGN.com has a heads-up about this Reddit user, who’s turned an old NES cart into a working NES. – From Kotaku and several other sites, there is a really cool box art book coming out for the Super Nintendo. It’s from this guy. – The 8-Bit Guy has a YouTube video about how the music was made on the NES and Commodore. – Good times, good times! From Destructoid, a guy pawned a Genesis, not knowing there was meth inside. – WDRB has a story on getting out of Your Parents Basement. Ugh, why would you ever want to do that? – NBA Live 2003 and NBA 2K3 game out for the Playstation 2, Xbox and Gamecube in 2002, oddly enough. Of course, NBA 2K3 was better. – Although they’re not classics, Beyond: Two Souls and Disgaea D2 came out in 2013.